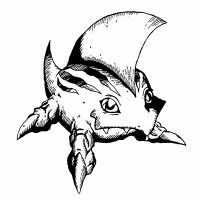 A quadrupedal Amphibian Digimon. 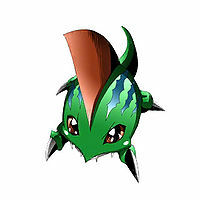 Although Betamon has a gentle, docile personality, once it is angered, it emits its "Dengeki Biririn" from its body, generating more than 1 MV of electricity to strike the opponent. 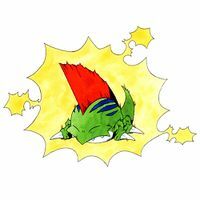 | Beta is possibly short for betabeta (「ベタベタ」) which means sticky, or betanko (「ベタンコ」) which means squashed. 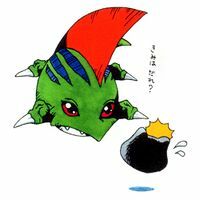 Dengeki Biririn  Electric Shock 電撃ビリリン N/A Electric Shock Discharges an electric current emitted from its body that is over a million volts, striking the opponent. Removes the sharp fin from its back and shoots it like a boomerang. カッターフィン Kattā Fin Beta Slugger/Fin Cutter Somersaults through the air while slicing at the foe. Causes a geyser of water to erupt from underneath the foe. Betamon appears in the background at Digitamamon's restaurant in Oh Friend! Were Garurumon. He is seated at a table with Elecmon when the restaurant is full of customers. Betamon is the partner of Michael, one of the Chosen Children from America. 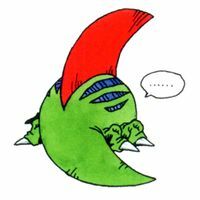 Michael was singled out to become a Chosen Child when he saw Gorimon in New York at the same time as Vamdemon was invading Tokyo. In April 2001, he received his Digivice, and was transported to the Digital World, where he met Betamon. 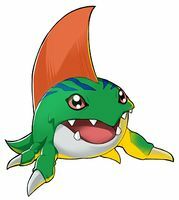 This Betamon can evolve to Seadramon. A Betamon is seen at Akiba Market. 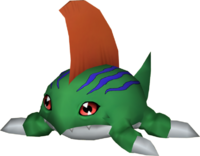 Betamon appears as an obtainable Child-level Virus type Digimon in Digimon World. 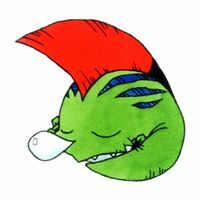 Betamon is first found as a NPC in Tropical Jungle that may be easily mistaken as the Modoki Betamon, which its a common enemy lurking around the area, and Betamon is identified by having a darker color. 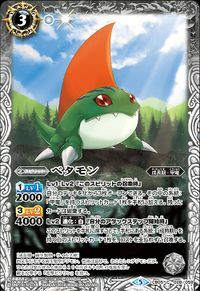 By going to the Mangrove Region, located at the northeast of the Tropical Jungle that can be accessed by a small wooden bridge, Betamon is seen standing still, claiming that he lost his memories and that joining the city may help recover its memories, as he joins the city without any need of fighting. Betamon helps out Coelamon opening a small shop where the Player can buy useful items such as Recoveries or Meat. Betamon also brings some more merchandise such as Auto Pilots. 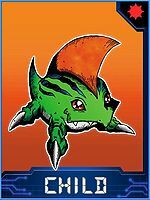 Once either Monochromon, Unimon, Patamon or Piyomon are recruited, they'll build an Item Shop, replacing Betamon and Coelamon's stands as the first is seen building a fountain where he now sits there. 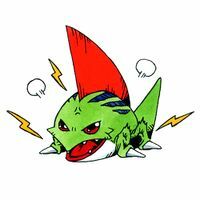 Betamon charges and releases a spark of electricity towards the enemy. 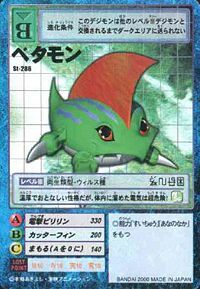 Betamon evolves into Dark Tyranomon (0-2 DP), Dark Lizamon (3-5 DP), or Tuskmon (6+ DP). 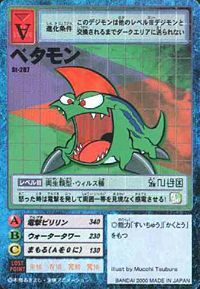 Betamon appears as an opponent and an obtainable Blue Card. Can be found in Data Forest. 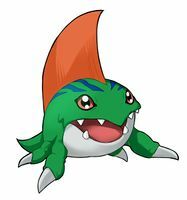 Can evolve to Seadramon if above level 13, or Scumon if above level 12 and qualities above 26. He also gives you a request mission to go see Etemon's concert live at Data Forest for him. 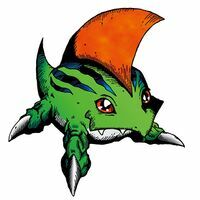 Betamon is an obtainable Virus Child-Level Digimon and belongs to the Deep Savers Field. Evolves into Octomon at Level 21 while having at least a minimum Defense Stat of 105 and a minimum Aquatic Experience Stat of 550. 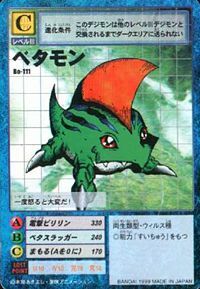 Evolves into Gesomon at Level 21, while having at least a minimum Attack Stat of 95 and a minimum Aquatic Experience Stat of 550. 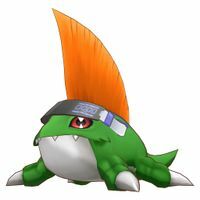 Evolves into Rukamon at Level 17, while having at least a minimum Spirit Stat of 100 and a minimum Aquatic Experience Stat of 500. 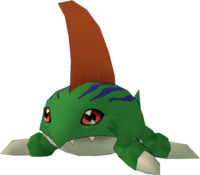 Betamon can appear as a wild Digimon at Angler Tunnel. Evolves from Koromon. Can evolve to Devimon, Meramon, Airdramon, Seadramon or Numemon. 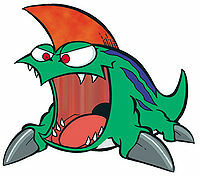 Betamon is an enemy Digimon in Area 01. Betamon is an enemy Digimon in Area 1. Evolves from Koromon. 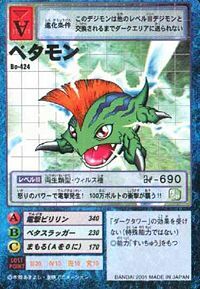 Can evolve to Garurumon, Seadramon or Numemon. It has a gentle and quiet personality, but the electricity stored in its body is dangerous! When it gets angry, it lets out an electrical attack that shocks everyone around it, both friend and foe! Once it gets angry there will be trouble! It gives off electric shocks with the power of its rage! It attacks with shocks of one million volts! !